When you schedule a party for the second-to-last day in January, you never really know what kind of weather to expect. It could end up being -15 degrees like the day your birthday boy was born. Or, it could be a beautiful sunny day in the high 40's. We were blessed with the latter on Saturday, and it was the perfect day for our little guy to celebrate turning TWO with family and friends! 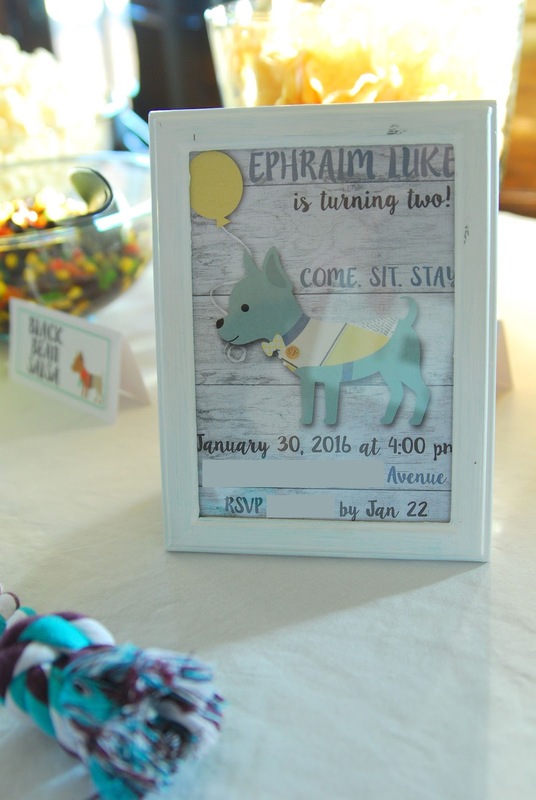 I've known for several months that I wanted to throw Ephraim a "Puppy Party". He has always loved dogs, and I thought it would be a fun and fairly easy theme to run with. I had a blast piecing together all of the design elements, foods, and colors. Take a look! One of the first things we did for the party is make a colorful tissue paper garland. The tassels are super easy and cheap, so long as you have a little bit of time to get them all cut out. I found the little yellow paper mache dog at JoAnn's, and I painted him with a yellow chalk paint. I printed the 2' x 3' "Happy Birthday Ephraim" poster at Staples for under $5. My mom always does an amazing job on her signature birthday sugar cookies! They are perfect. I ordered these cute paw print paper straws from Etsy. I lucked out by finding the matching white paw print balloons at our tiny party store! This was my first time making Black Bean Salsa, and I should post the recipe--it's delicious! After everyone ate and chatted, we sang "Happy Birthday" and cut the cake! Ephraim was all about the cake this year! Puppy Chow, for the win! Thanks to all who came and made E's party so special! Our little boy is so loved. Happy 2nd Birthday, Ephraim Luke!! I can't believe today is February 1st. Hope you have a great Monday! You do such cute parties for your children! My daughter will turn 2 in October and I've been tentatively planning to have a puppy party so this was super helpful! This is so cute!! What great ideas! I actually have a friend who is throwing a "dog party" for her soon to be 3 year old daughter, per her daughters request, and I'll definitely have to show her what you put together here! So cute!! Looks like a fun party and happy 2nd birthday to your little guy! Adorable! So many perfect details!!! That hydrant is amazing! Gorgeous family photo! You should definitely frame it. That fire hydrant is wildly creative. One of the small things that I adore about things you design is your handwriting. You manage to make a welcome sign look perfect. Have you always had great handwriting? This is so cute! That firehydrant is SO cool! I love your attention to detail! The party looked amazing! Eek! How cute everything is! The paper mache puppy and the fire hydrant are so darling! Great little dish tags, with a play on words. You and your mom are so creative! And how did you stay so clean in a white dress?! Happy Birthday to your sweet boy! What a fun theme! You are beyond talented - everything for this party looks amazing! I am in love with the theme. Happy birthday to your darling boy! I love puppy chow!! Such a fun party :) I NEVER would have guessed that's how you made the yellow hydrant! That is awesome! Happy Birthday to your guy! So precious...you are great with all the little details Rachel!